Chris Guccione left Wednesday's Cubs-Pirates game due to a foul ball injury to the jaw/face. 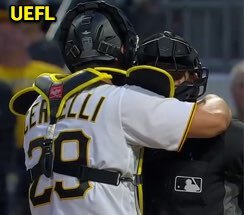 PIT catcher Francisco Cervelli holds up Gooch. In the top of the 3rd inning, Cubs batter Jason Heyward fouled a 1-2 93.6-mph fastball from Pirates pitcher Steven Brault into the lower portion of Guccione's traditional-style facemask. Guccione remained in the contest through Heyward and subsequent batter Javier Baez's at-bats, upon which he left the game, 2B Umpire Ed Hickox taking over behind the plate with 1B Umpire Ramon De Jesus and 3B Umpire and Crew Chief Jerry Meals remaining in the field. Relevant Injury History: Guccione left the May 26, 2016 Diamondbacks-Pirates game, also in Pittsburgh, after a foul ball struck the jaw and chin portion of his facemask.